Samsung has announced its latest consumer camera in the shape of the NX10. The NX10 is the manufacturer’s first foray into the hybrid interchangeable lens market and offers ‘best in class’ features, according to Samsung. The NX10 incorporates a 14.6MP APS-C CMOS sensor and a new DRIMe II Pro processing engine that, combined with an advanced AF algorithm, offers one of the fastest auto focus systems on the market according to Samsung. The model also offers full HD video capture at 720p resolution and H.264 compression. The NX10 boasts a large 3in AMOLED screen, a technology that Samsung claim offers easier viewing at acute angles and around 10,000 times faster response rate that conventional LCD screens. The NX10 is Samsung’s first interchangeable lens camera, and is launched with an 18-55mm kit lens, 30mm pancake lens and 55-200mm telephoto lens, all of which utilise a new lens mount. 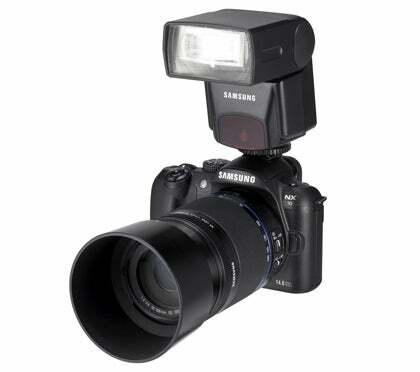 The Samsung NX10 has a provisional availability of later this month, but this and price are still to be confirmed. See below for the full press release, specification and images of the camera. The Samsung NX10’s innovative technology provides ‘best in class’ features with a large APS-C size sensor, bright AMOLED screen and fast auto focus to give users ultimate performance. Las Vegas, NV, January 4th, 2009: Samsung Digital Imaging Company Inc., today announced the Samsung NX10 at the Consumer Electronics Show in Las Vegas – an innovative digital camera that provides users with an interchangeable lens system and optimum image quality in a sleek, compact body. Delivering creativity without compromise, users can now be as creative as they want on the move, without having to compromise perfect images. The NX10 incorporates a fast and decisive auto focus (AF), 14.6 MP APS-C size CMOS sensor and unique, large 3.0î AMOLED screen, allowing users to easily view their images, even in bright sunlight. Users can also record in HD movie to create the full story. Available in two colors, Noble Black and Titan Silver, the Samsung NX10 is small, light and ergonomically designed to ensure maximum portability for everyday use. The Samsung NX10 ensures users never miss a moment, with one of the fastest AF in its class on the market. The company’s latest innovation, the new DRIMe II Pro engine and advanced AF algorithm, also provide ultra fast AF speed with the higher precision of contrast AF. The Samsung NX10 has the heart of a DSLR embedded inside the compact frame of a digital camera, successfully integrating the APS-C size CMOS sensor with a mirrorless interchangeable lens, for a sleek, lightweight camera that users can easily take with them everywhere they go. Consumers are not just limited to taking shots but can also tell their own stories in video format with HD movie recording (H.264 codec). 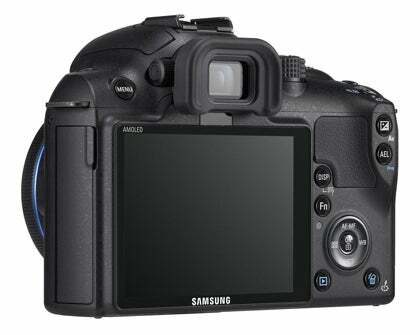 Samsung continues to extend the usage of AMOLED screens across many products, using a large 3.0î AMOLED screen in Samsung NX10. AMOLED provides easier viewing even in bright sunshine and at acute viewing angles, meaning users no longer need to shield their screen with their hand. The category leading screen also provides 10,000 times faster response rate than conventional LCDs, has a far lower power consumption and higher contrast ratio – 10,000:1 vs. 500:1. The Samsung NX10 also contains a range of intelligent features to put professional quality images within reach of the amateur photographer. The Samsung NX10 includes in-depth manual controls and also a Smart Auto function which automatically detects the surrounding environment of the shot and selects the right shoot mode. Its Smart Range feature also enables the user to vividly express both bright areas and dark areas in the same frame, and the Supersonic Dust Reduction system keeps those dust particles clear of the image sensor that can often impair an image. It even senses when the user brings the camera close to their face to look through the viewfinder, and puts the AMOLED screen on standby to conserve power.